The idea originated with the School of Salamanca in the 16th century, and was developed in its modern form by Gustav Cassel in 1916, in The Present Situation of the Foreign Trade. While Gustav Cassel’s use of PPP concept has been traditionally interpreted as his attempt to formulate a positive theory of exchange rate determination, the policy and theoretical context in which Cassel wrote about exchange rates suggests different interpretation. In the years immediately preceding the end of WWI and following it economists and politicians were involved in discussions on possible ways of restoring the gold standard, which would automatically restore the system of fixed exchange rates among participating nations. The stability of exchange rates was widely believed to be crucial for restoring the international trade and for its further stable and balanced growth. Nobody then was mentally prepared for the idea that flexible exchange rates determined by market forces do not necessarily cause chaos and instability in the peaceful time (and that is what the abandoning of the gold standard during the war was blamed for). Gustav Cassel was among those who supported the idea of restoring the gold standard, although with some alterations. The question, which Gustav Cassel tried to answer in his works written during that period, was not how exchange rates are determined in the free market, but rather how to determine the appropriate level at which exchange rates were to be fixed during the restoration of the system of fixed exchange rates. His recommendation was to fix exchange rates at the level corresponding to the PPP, as he believed that this would prevent trade imbalances between trading nations. Thus, PPP doctrine proposed by Cassel was not really a positive theory of exchange rate determination (as Cassel was perfectly aware of numerous factors that prevent exchange rates from stabilizing at PPP level if allowed to float), but rather a normative policy advice, formulated in the context of discussions on returning to the gold standard . There can be marked differences between purchasing power adjusted incomes and those converted via market exchange rates. For example, the World Bank's World Development Indicators 2005 estimated that in 2003, one Geary-Khamis dollar was equivalent to about 1.8 Chinese yuan by purchasing power parity —considerably different from the nominal exchange rate. This discrepancy has large implications; for instance, when converted via the nominal exchange rates GDP per capita in India is about US$1,965  while on a PPP basis it is about US$7,197. At the other extreme, for instance Denmark's nominal GDP per capita is around US$53,242, but its PPP figure is US$46,602, in line with other developed nations. For example, in 2005 the price of a gallon of gasoline in Saudi Arabia was US$0.91, and in Norway the price was US$6.27. The significant differences in price would not contribute to accuracy in a PPP analysis, despite all of the variables that contribute to the significant differences in price. More comparisons have to be made and used as variables in the overall formulation of the PPP. In some emerging economies, Western fast food represents an expensive niche product priced well above the price of traditional staples—i.e. 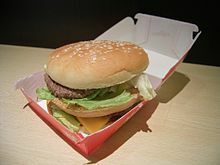 the Big Mac is not a mainstream 'cheap' meal as it is in the West, but a luxury import. This relates back to the idea of product differentiation: the fact that few substitutes for the Big Mac are available confers market power on McDonald's. For example, in India, the costs of local fast food like vada pav are comparative to what the Big Mac signifies in the U.S.  Additionally, with countries such as Argentina that have abundant beef resources, consumer prices in general may not be as cheap as implied by the price of a Big Mac. The law of one price, the underlying mechanism behind PPP, is weakened by transport costs and governmental trade restrictions, which make it expensive to move goods between markets located in different countries. Transport costs sever the link between exchange rates and the prices of goods implied by the law of one price. As transport costs increase, the larger the range of exchange rate fluctuations. The same is true for official trade restrictions because the customs fees affect importers' profits in the same way as shipping fees. According to Krugman and Obstfeld, "Either type of trade impediment weakens the basis of PPP by allowing the purchasing power of a given currency to differ more widely from country to country." They cite the example that a dollar in London should purchase the same goods as a dollar in Chicago, which is certainly not the case. ^ Cassel, Gustav (December 1918). "Abnormal Deviations in International Exchanges". The Economic Journal. 28 (112): 413–415. doi: 10.2307/2223329. JSTOR 2223329. ^ Kadochnikov, Denis (2013). "Gustav Cassel's purchasing power parity doctrine in the context of his views on international economic policy coordination". European Journal of the History of Economic Thought. 20 (6): 1101–1121. doi: 10.1080/09672567.2013.824999. ^ Taylor and Taylor, Alan and Mark (Fall 2004). "The Purchasing Power Parity Debate" (PDF). Journal of Economic Perspectives. 18 (4): 135–158. doi: 10.1257/0895330042632744.